Father’s Day is this weekend. Dad is always there for us when we need support, guidance, a good laugh, someone to stand up for us, and often to foot the cost of our wedding. Dad knows you’ve dreamt of your wedding day since forever and despite the griping, he’s happy to make your dreams come true. 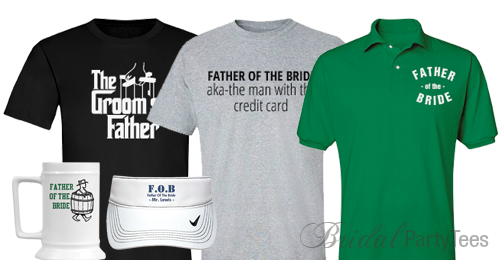 We want to honor all the FOB and FOG’s with our Father of the Bride gifts and our Father of the Groom gifts! 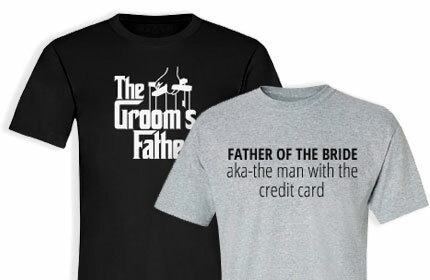 If you’re Dad is helping you get the wedding of your dreams right now, then you absolutely must make this Father’s Day one he won’t forget! 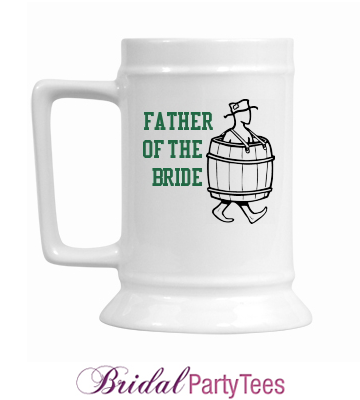 Customize a beer stein for the Father of the Bride so that he can relax from the stress of planning (and paying for) a wedding. 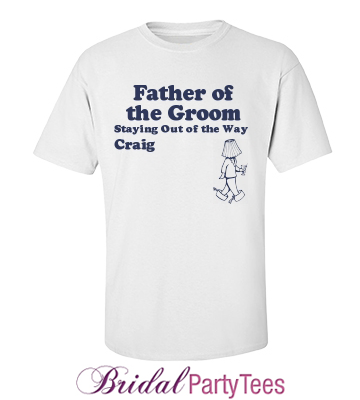 Design a Father of the Groom gift like a funny t-shirt to let him know you appreciate his help and that he isn’t forgotten! Whether you’re planning a wedding right now or not, be sure to thank your Dad this Father’s Day for everything he does. A wedding ceremony is a happy time that you want to spend with everyone you love dearly. That is why many brides want to honor love one’s that have pasted in their ceremony. 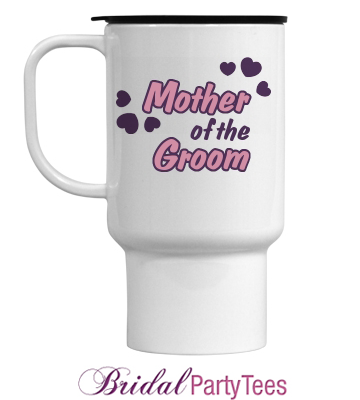 There are many options to honor your loved ones in your wedding. I personally did a couple different things. I carried a locket on my bouquet with my grandmother’s picture on one side and my husband’s grandmother and grandfather’s picture in the other side. I also, had the mother’s light a memorial candle instead of a unity candle. Both mother’s carried a little tapered candle up the isle that they used to light the candles. My mother lit a candle for my grandmother and uncle and my mother-in-law lit the candles for her parents. We also, made a donation to the Cancer Society and the Heart Foundation in honor of our grandparents. They were subtle touched that meant a lot to my husband and I. I think the key is to find something that is meaningful to you and your family. So, here are just some of the options to choose from. 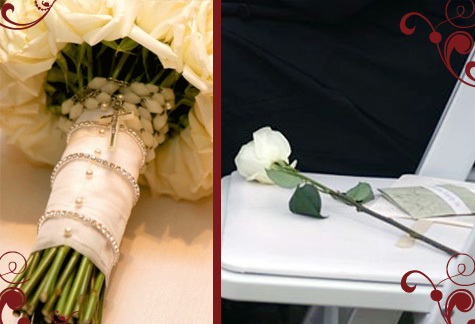 Bouquet Embellishments: Some brides choose to embellish their bouquets to show remembrance for a loved one. One option is to add a locket to your bouquet. You can also tie a rosary around your bouquet. 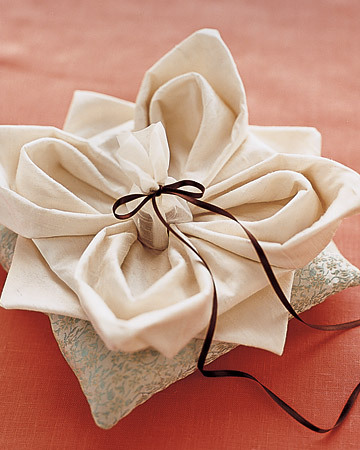 Also, if you have a ribbon or a piece of fabric from your loved on you can have your bouquet wrapped in it. For example, one bride took a piece of her mother’s wedding gown and used it to wrap her bouquet. Candles: Candles can be lit in remembrance. This is a wonderful to honor grandparents, parents, and close relatives that have passed. You can even have the officiant say a prayer for your loved ones as the candles are being lit. 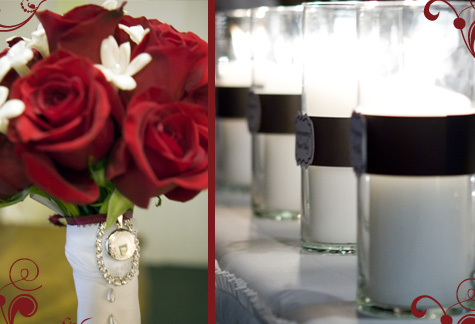 Another option is to explain the significance of the candle lighting in your program. Photos: Placing photos of those you want to honor in a visible place at the ceremony or reception is another way to show remembrance. You can place a flower or a candle by the photos, or even a beautiful poem. Music: This is a tried and true way to remember a loved one at your ceremony. You can have a family member or a wedding singer sing a dedication song for your loved ones. Another option would be to have the DJ make an announcement and play a song in remembrance of the ones you want to honor. Symbols: Anything that reminds you of a loved one is fine: butterfly bouquet picks, for example. Or a picture-frame pin and photo pinned to a bouquet wrap ribbon, or a monogram pin in the letter of someone you’ve lost. A number of stores sell “In Loving Memory” brooches you can pin to a sash or ribbon. 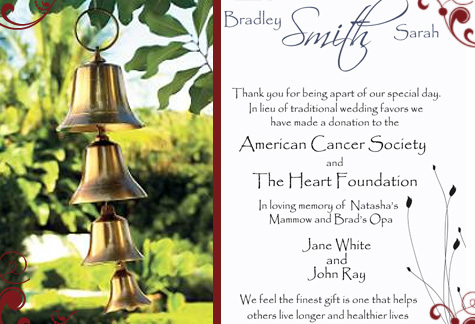 Bells in Trees:This is one of my favorite options if you are having an outside wedding. You hang bells in the trees from ribbons. Then every time the bells ring it symbolizes the presence of your loved ones and how they are always with you. Charitable Donations:The “donation in lieu of favors” is a time-tested way to honor someone you’ve lost to a physical illness. Individual cards or a framed table note will let guests know who was on your mind. Some brides set out real or enamel ribbons symbolizing the type of loss involved: pink for breast cancer, teal for ovarian or testicular cancer, and so on. (See Awareness Ribbons Meaning & Colors.) Another option: the bride and her bridesmaids wear awareness bracelets. You can buy the awareness charms individually and make your own, or source the finished bracelet from a number of sites. A Moment of Silence: Many couples take a second from their wedding ceremony to dedicate a moment of silence to their loved ones. The officiant can also say some words to member the ones you want to honor. Seat of Honor: You can reserve seats for those you want to honor at you wedding. You can add flowers or decorations to the vacant seat. The officiant can also mention what the seat represents to the bride and groom. Another option is to have your florist add a loose flower to your bouquet for each person you want to honor and you can place them on the vacant seats before you go to the alter. Food:This might seem a little more lighthearted, but you can honor family members by including a famous cookie or candy recipe with your desserts, a signature appetizer on the menu, or a favorite sweet in a candy buffet (did a father love Hersey Kisses?). Include a small framed note that explains the connection. Clothing: A touching way to remember someone is to wear one of their personal items. Brides have worn their mother’s or grandmother’s veils, or sashes made from the wedding dress. Grooms have worn their father’s tuxes or cufflinks. And let’s not forget jewelry: brides have woven a rosary, locket or set of pearls into their bouquet, and worn a father’s ring around their neck or on their thumb. 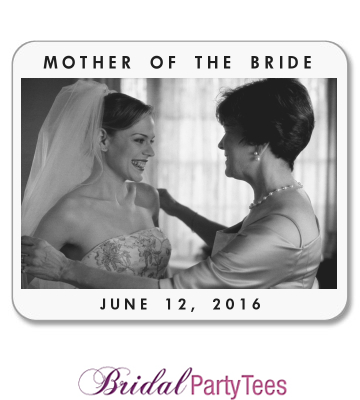 As a newly picked Maid of Honor you have got the job because you are dear to the bride. There are many duties that come a along with the position, but remember that it is an honor and the bride picked you because she trusts you. Every bride is different, so make sure you check with her to see what she needs your help with. But here are a few items that may be on your plate. Your number one duty is to keep the bride calm. If she has asked you to be her Maid of Honor that means that she really trusts you. You are the one that knows her stress points and can really help defuse a situation. This may come up in planning or on the actually wedding day. 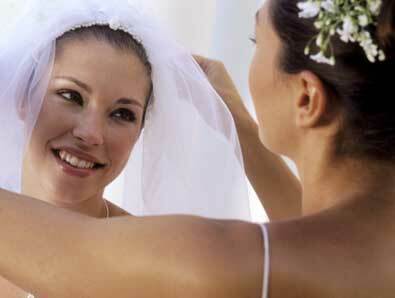 Just be as helpful as possible and serve as moral support and your bride is sure to be happy. 2. Time to pick out the dresses! 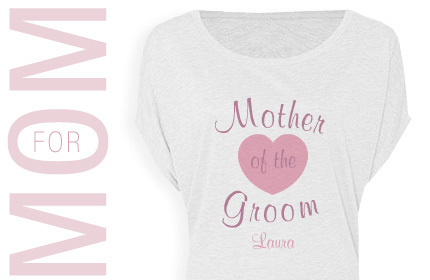 Typically, the Maid of Honor accompanies the bride when she is looking for her wedding gown. You can be of great help when it comes to the final choice. You could take pictures for her in different gowns to take home and look at or simply serve as an extra pair of eyes. Plus, it is fun! You may also be asked to help her pick out bridesmaid dresses. Help her choose styles that will flatter all body types. Also, make sure the dresses will be ordered in enough time to accommodate any alterations that may be needed. Many times it is hard for the bride to make final decisions about the wedding. Your opinion can be of great help in this area. This may include going to look at wedding venues, picking out invitations, picking a cake design, or any other details she is on the fence about. 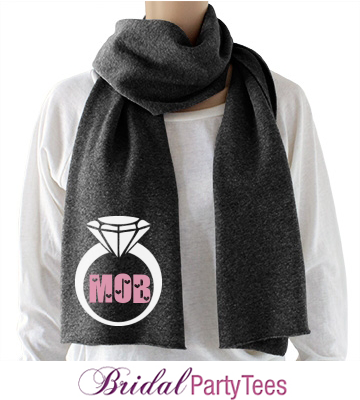 The bride may need you to accompany her in completing her gift registry. You can be of great help to make sure she registries for everything she needs. This is a fun trip. So, make the most out of it! You can really help the bride by keeping all of the bridesmaids organized and informed of the wedding details.See to it that all bridesmaids get to the rehearsal; coordinate transportation and lodging, if necessary.Also, make sure that all bridesmaids get their hair and makeup done, get to the ceremony on time, and have the correct bouquets. Help address and/or put together wedding invitations. 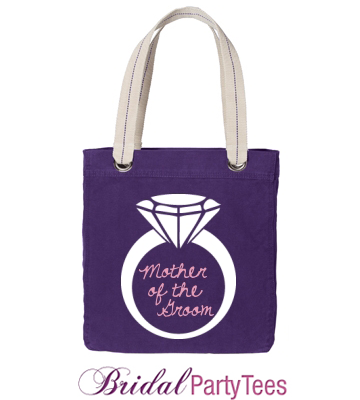 Typically the Maid of Honor gets to host the bridal shower and the bachelorette party. You can be of extra help by keeping track of all of the gifts and who gave them. This will be of great help for than you cards. Need I say anymore? Totally fun! 8. Hold on to that ring! Oh… and the bouquet too. Hold the groom’s ring during the ceremony. Safest place to put it? On your thumb. As for the bouquet, just hold onto that while the bride says her vows. Easy as pie! Often times the bride is so busy she does not have time to think about eating. Make sure the she takes a moment to eat something. You can be of great help by refreshing her drink, getting her a plate of food from the buffet table, or instruct the wait staff to keep her entree warm. Help the bride get out of her wedding dress and accessories. Also,make sure they are in a safe place while she is on her honeymoon. This is for all of you out there that are looking for a great way to pop that big question. 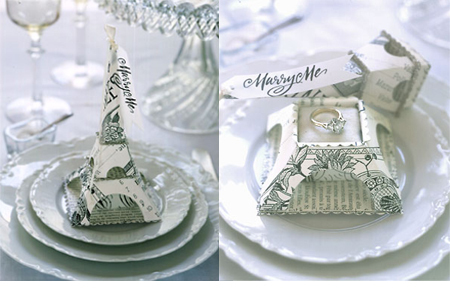 This Eiffel Tower Design opens and reveals a unique and romantic way to ask for her hand in marriage. I love it! What could be more fitting than the most well known symbol from the city of love? This little box could also be used at an ubber chic city wedding to hold favors. Check it out! As I was sitting down and completing all of my thank you cards last night, I realized that it is hard to think of something personal and unique for every single person! I really feel for you girls that had a big wedding, because I barely got through my fifty cards. I can’t imagine what those of you who have 180 are going through! That’s when I got the idea for this post. 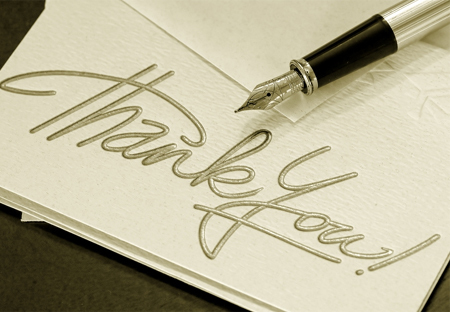 To help you out, I have compiled a list of sayings for thank you cards. Shhhh…It will be our little secret! giving us a lasting memory. memory of your kindness and generosity. and sharing in our love. And touched us in a special way. Without the love of our family and friends. than the lovely gift from you. Just “Thank you” can say! and for the very lovely gift.